MoviePass announced at Sundance that it will officially get into the film rights business. MoviePass Ventures will acquire film rights and build out their offerings, and they have started scouting at the festival. Ted Farnsworth is the chairman and CEO of Helios and Matheson, the parent company of MoviePass. He joins Cheddar from Sundance to explain the new initiative. Farnsworth says this has been the plan since day one. When the announcement was made at Sundance, it immediately became a big buzz. Farnsworth says MoviePass is, "totally disrupting the whole market." MoviePass has already started to bid on some products at Sundance. When asked if MoviePass intends to increase the price above $10, Farnsworth says he is happy with where it is now. Growth has been strong and there is no advertising, so growth has been completed from word of mouth. Farnsworth explains that MoviePass may look into more premium membership plans, but are keeping the price where it is for now. MoviePass' focus for now: continue to build their subscription base. MoviePass wants a piece of the action. The subscription ticketing service, which charges a $9.95 monthly fee for unlimited theatrical moviegoing, announced at an industry panel on the opening day of the Sundance Film Festival that they are going to bankroll co-acquisitions with other film distributors. Their new subsidiary, MoviePass Ventures, will be on the prowl at Sundance for product to parse and partners to piggyback. “We’re open for business,” said Ted Farnsworth, CEO of data analytics firm Helios and Matheson Analytics Inc (parent company of MoviePass). He described the strategy as a way to “put skin in the game” alongside established industry vets who know how to book movies into the right multiplexes and shepherd their theatrical runs. No companies have been announced yet as candidates for the joint releases, but the toe-dipping into distribution is reminiscent of Amazon Studios, which launched in 2015 with strong assurances that the e-commerce giant and streaming powerhouse would partner with established distributors to assure the sanctity of theatrical windows. Late last year, though, Amazon Studios announced that they were dropping the partnerships and will handle all their own theatrical distribution going forward. Will MoviePass eventually do the same? It’s anybody’s guess, since so much has changed since the service was founded in 2011. Initially, subscriptions were $50. But at that price point, their consumer base hovered around 20,000. Since dropping the price to $9.95 in 2016, subscriptions have exploded to more than 1.5 million. The company is burning through money, since they guarantee payment of the full ticket price every time one of their subscribers goes to the movies. 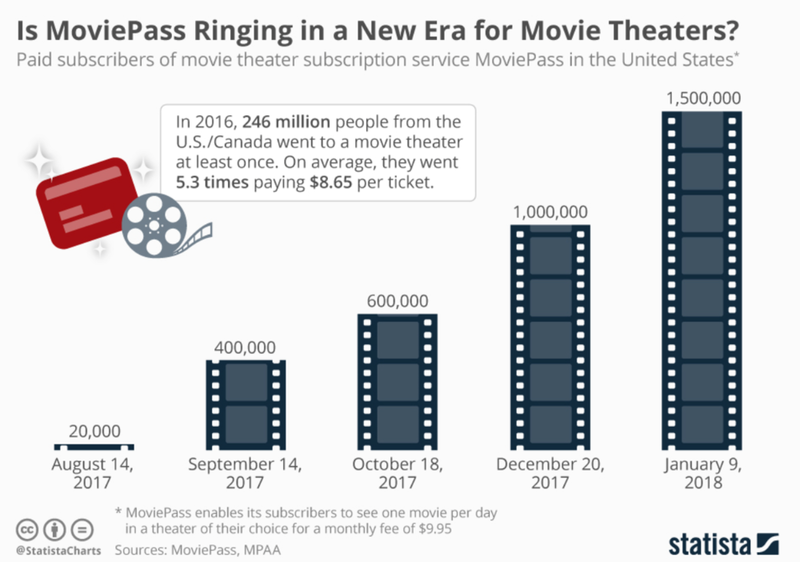 Now that so many people have been using MoviePass over the past six months, though, the company can honestly lay claim to significant granular data about their customers’ specific viewing habits—a potential gold mine for film distributors. MoviePass is currently paying for 3 percent of the U.S. box office. Yet they claim to have boosted 10 percent of the indie film theatrical bookings, which explains their pivot to help distribute movies that debut at festivals like Sundance. They’re goosing attendance for the specialty market—why shouldn’t they angle to get a slice of that revenue? Then again, filmgoing audiences has been slowly eroding for years. It’d be great if MoviePass can disrupt the decline. But expect further tweaking on their business model. The model, of course, is risky. And theater owners like AMC have already lashed outagainst the service claiming its low-cost tickets are devaluing the movie-going experience.